Transcriber's note: spelling or punctuation not understood is marked: ??. Transcribed at Broadstone, Dorset April 2005.
by the Rev. Abraham Bennet of Wirksworth. 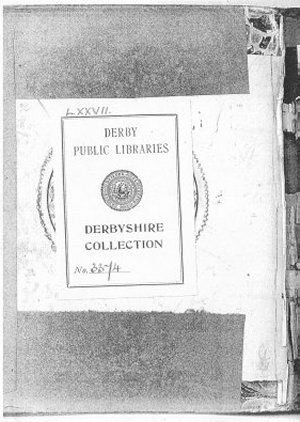 The original document is preserved at Derby Local Studies Library, 25B Irongate, Derby, Derbyshire DE1 3GL, England. Telephone 01332-255-393. The document is presented in a blue case binding with titled Spine. Height 204 mm, Width 160 mm, Depth 24 mm. The document itself is in book form. Height 190 mm, Width 156 mm, Depth 18 mm. The book has a hard binding, taupe (brownish grey) in colour with a taped spine and is in need of rebinding. There are 160 pages, all written in longhand. 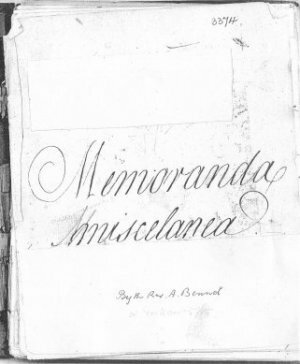 There are also a number of miscellaneous documents, including letters and accounts contained within the book. The spine stitching has deteriorated and the page groups are separate within the binding, some pages are fully detached. The pages are in excellent condition but somewhat yellowed due to age and the paper in places is extremely brittle. The hand writing is generally clear but ink has penetrated through the pages giving a shadow of the writing on the opposite face of the page. There is some staining and ink blotting and a number of pages have holes in the text. 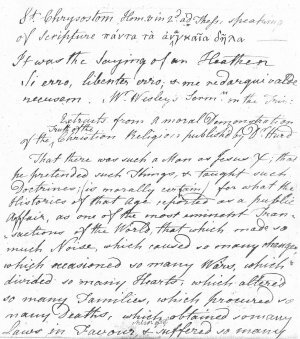 Wesley's Sermon quoted on page 1 was written on 8 May 1775, establishing an earliest start date for Bennet's Notebook. 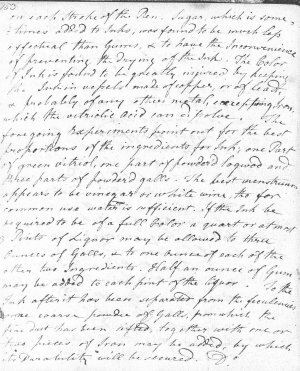 Observations in Bennet's major work "New Experiments on Electricity" begin on 24 May 1787 but are not mentioned in the Notebook, perhaps establishing a latest end date for his Notebook. or about him or from him. the Person of J C.
many of the godless to wait for him. Mother, & God was his Father. Philosophy, Ex Nihilo nihil fit. progression of effects without a Cause. Being to be immediate, & absolute. the world, not even of our own. Ghost left the veil of Mystery undrawn. which no man needs to disown. till Avarice or Ambition parted them. we are utterly ignorant. Sen.Mor. yet at last to be outdone by a Hogshead? over all Countries, & to all Ages. of Freemasons was first Instituted. of sense, Knowledge, & worthy Qualities? to render both better by the Contact? Debouchery are banished & unqualified. true, the good or the great. Sciences & liberal Arts of all kinds. this Banner, to the most High. Fountain were the following Ingredients, viz. than 6000 Men drank thereof. of the City which they intended to build. however simple above their most zested Enjoyments. he would only thus multiply mutual Destruction. & the Embryo in the Womb, is very striking. among the Primitive Xians of the East. & down, as lively & active as a Puppy. upon men, & with as surprising Success. the Inspiration sometimes exceeds the Expiration. matter which was imbibed before. Improbible. much illustrated by Mr Papin's Digester. of all mettals, is to Gold as 7 to 19.
scarce the 360000th part of one inch thick. in Nature: nor even Light itself. Niagara a River in Canada has a strange  Cataract. the Beholders in a manner not to be exprest. Heat of a refiners Fire. of earth every four & twenty Hours. them, in an uniform & equal manner. without the orbit of the Earth. of fair water with a beautiful yellow. Force, makes in all 18,284,144.
is neither more nor less than 2,910,164 miles. high, of quicksilver about 30 inches. higher it will become transparent again. leap into the Boat & are easily taken. takes them by the legs. breed in Ponds but not in Glasses. at Muscow, weighing 320,000 Pounds. of Lightning, may make the following Experiment. a large, thin silk handkerchief when extended. that the ribbon may not be wet. Pate & the money out of his purse. Lays her fullness before you - Want? Why want? never act rashly or inconsiderately. and blaze beneath the Lightnings of the God. The vanquished triumph, & the Victors fly. To win the wisest, & the coldest warm. Silence that spoke, & Eloquence of Eyes. Take this & with it all thy wish she said. The powerful Cestus to her snowy breast. Their strength he withers & unmans their souls. The God in Terrors, & the skies on Fire. Paw with his hoofs aloft, & las the air. Divide his Heart, & Wage a doubtful War. And feels a Pinion lifting every Limb.